Velikost tohoto náhledu: 400 × 600 pixelů. Jiná rozlišení: 160 × 240 pixelů | 320 × 480 pixelů | 512 × 768 pixelů | 682 × 1 024 pixelů | 2 336 × 3 504 pixelů. 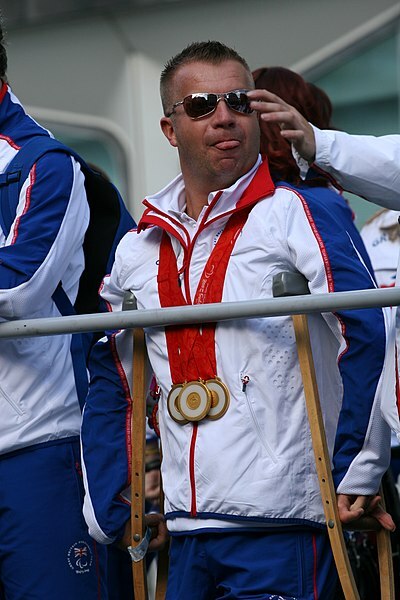 English: Lee Pearson, British Paralympic equestrian, at the parade in London to celebrate the achievements of British competitors at the 2008 Summer Olympic and Paralympic Games. This image was originally posted to Flickr by zoonabar at https://www.flickr.com/photos/92496717@N00/2946152065. It was reviewed on 18. října 2008 by FlickreviewR and was confirmed to be licensed under the terms of the cc-by-2.0.